Carlos Santana and Buddy Guy got together onstage for a surprise jam at the annual Experience PRS event in September. Carlos was introducing his new 25th Anniversary Santana model as seen in this clip, while Buddy played an all-white, maple-neck PRS 305. The 305, as I mentioned in an earlier article, is a 25 1/2" scale instrument that is the nearest thing in the PRS line to a traditional Strat. Buddy, a die-hard Stratocaster player, appears a little thrown off when he starts his solo. You can tell that he is playing licks that he would normally play on his Fender -- licks that would simply sing when executed with glassy Strat tones. The 305 is obviously a lot more meaty sounding with a thick mid-range which he appears to be unaccustomed to. But he soon finds his footing by unleashing a few Santana-esque lines of his own. If you can't beat 'em, join 'em. But I must say the Santana 25th Anniversary sounds pretty good. Carlos' mildly-overdriven-and-magically-on-the-verge-of-feedback tones are simply unctuous. Also making its debut at Experience PRS was the Carlos Santana Abraxas SE model. A limited edition model, the Abraxas SE is a take on the Les Paul Junior-style, with a single soapbar pickup and a wrap-around bridge. 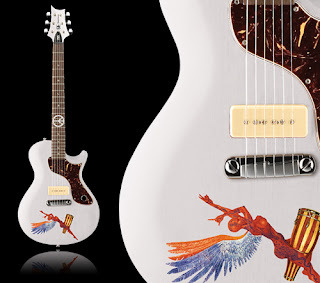 The instrument is adorned with a graphic from the Abraxas album art and a peace-symbol inlay at the twelfth fret. As a side note, Buddy Guy's pic from this very same concert now appears on the PRS website on the model 305 page. Could this be a sign of a burgeoning new relationship? Great Prices On PRS Guitars Here!